There are a few myths about riding horses that could actually prevent you from learning to ride well. 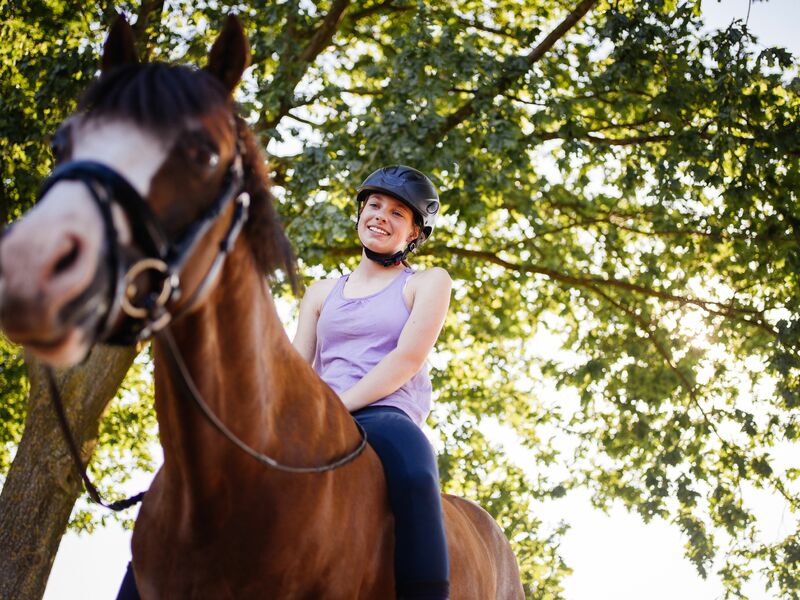 Here are the seven top myths about horseback riding. This myth makes horse riders laugh. It also makes them wish they could make the person who believes this get on a horse and ride a dressage test, or go out on a ten-mile trail ride. Those of us who ride know that it takes much more than sitting to ride a horse. Sitting is something you do on a couch, but on a horse, you are using many more muscles, your balance, and your brain. That's not sitting. That's an activity that includes many skills and body awareness. Riders need to understand how horses think, and that our horse's first priority is not the rider's safety and comfort but their own. As prey animals, horses are not programmed to be self-sacrificing. Riders need to understand how to make their horse trust them by always being consistent and good leaders. If you let a horse think for itself and trust it to make its own decisions, you are asking the horse to be a leader, and that can lead to problems. Being the leader is your job. There are many stories about horses that have saved their rider's skin through some harrowing experience. However, as romantic as these stories are, it’s more likely that the horses extricated themselves from a bad situation, and the riders were able (by luck or skill) to stay aboard. There are three motivating forces in a horse's life: eating, reproducing and seeking safety. While some may be more willing workers than others, no horse has ever jumped a course of fences, gone out for a long hike, performed a dressage test, cut cattle or run the barrels on its own whim. Left to themselves horses like to eat, feel safe with their herd buddies and reproduce. And while a well-trained horse can do many things for a rider, it's unlikely they will ever offer to do any of those things unasked. A lot of people don't like this fact, but horses don't like to be ridden. Does this mean we shouldn't ride them? The trade-off for being ridden or driven and having their reproduction controlled is that we take care of the eating and safety part of their lives. Everyone needs a job. Not everyone likes their job. And because our horses have no choice, we need to ensure we are making that job as comfortable as possible by learning to ride well and taking care of things like saddle fit and proper nutrition. It's a myth that people who aren't confident riders are inexperienced riders who need to understand how horses think. If that were true, then there wouldn't be riders with years of experience working with and riding horses suddenly finding they've 'lost their nerve'. Whether it's a result of a bad accident, or you've just started playing a game of 'what if' in your brain, loss of confidence can happen to the best of riders. The good news is, fear can be overcome. It just may take some time and outside help. Gaited horses aren't easier to ride than any other horse. The only difference between riding a horse with gaits is that you may not have to post the trot. That's only one less skill out of the many you may have to learn. A horse is a horse, regardless of its gaits, and you still need a good seat and hands and to understand your horse to be comfortable and safe. Again, this is a claim that is made by someone who hasn't ridden or worked with horses. The goal of exercise is to strengthen your muscles, increase your endurance, and improve your balance. Horseback riding does all of those, and it uses a few muscles, like those along the inside of your thighs, that few other activities do. Exercise burns calories, and horseback riding also fits that bill. Lifting and carrying saddles, grooming and spending time in the saddle all contribute to your fitness. Riding is also good for your internal organs. Even at a walk, there are fitness and health benefits to riding.